Well, doesn't this stink: Blogger ate my long-belabored post on presocial chalcidoids. Hence, the last Life, et al. post for April will be...a gripe. I know: quite a deviation from the paradigm, isn't it? Insects will still be featured herein; have no fear. The book with which I'm going to pick a bone is Exploring Creation Through Biology (second edition), by Dr. Jay Wile and Marilyn F. Durnell. Now read closely: this post is not an attack on creationism; it is primarily addressed to creationists, and not created for the amusement of those of us who believe in evolution. While I heartily disagree with the views espoused in Exploring Creation Through Biology regarding anthropogenic climate change (or "global weirding"), they shall be deferred: instead, I am pointing out factual, not theoretical, errors in the text. In order to save time, I will copy most of my letter of complaint (with citations) sent in February 2012 to Apologia Educational Ministries, Inc. (the textbook's publisher). I—a homeschooled 16-year-old—am writing to complain about some errors in your otherwise relatively satisfactory textbook Exploring Creation with Biology, 2nd Edition (2005), by Dr. Jay Wile and Marilyn F. Durnell. Principally, they pertain to your treatment of dinosaurs (and other prehistoric reptiles), which is slipshod in some places: for example, the names of specific genera of prehistoric animals—wherever they are mentioned (13 times)—are not italicized (nor capitalized, for that matter), which any person with so much as a passing interest in biology knows is required of the scientific names of all life forms. Not only that, but the claim on page 505 that “biologists think that [sauropods] were swamp-dwelling” is outdated by about 35 years at the time of the book’s publication: true, it was at one time supposed that sauropods were aquatic, simply because it was thought that their great size required support from water (and also because of the location of Brachiosaurus’, Apatosaurus’, and Diplodocus’ nares at the zenith of their skulls), (Hatcher, 1901; Matthew, 1915); however, it was convincingly argued in 1951 that respiration through elevated nostrils while the remainder of the body was submerged would have been physiologically impossible for sauropods, as the pressure on the animals’ chests would have been too great (Kermack, 1951); furthermore, the allegedly graviportal construction of their limbs and feet (inferred from evidence from abundant fossilized tracks known on most continents—Bonnan, 2005; Riga & Calvo, 2009) precludes any need for bodily support from water. Granted, as Wile and Durnell ruminate on page 506, any hypothesis about dinosaur posture is highly speculative and ought to be regarded with caution. We really have no idea whether sauropods were amphibious or not, and we will never have one. Nonetheless, contrary to “biologists think that [sauropods] were swamp-dwelling”, paleontologists have consistently regarded these dinosaurs as terrestrial since at least the 1970s (“Diplodocus”—Wikipedia, the free encyclopedia). Another error lies in Figure 16.3’s rather poor impressions of a number of famous prehistoric reptiles, and especially in that of Tyrannosaurus. The illustration of the famed theropod clearly depicts it in an almost vertical (around 45°) posture—a restoration, although popular once upon a time for bipedal dinosaurs in general (beginning during the Civil War; Leidy, 1865), that was largely abandoned a whole generation ago when it was shown that in life such a tail-dragging gait would have probably resulted in the weakening (or even dislocation) of several joints, including the hips and the connection of the head and spinal column (Newman, 1970). Living erect bipedal animals with long tails (like kangaroos) are generally saltatorial, but a leaper the supposedly 7-ton Tyrannosaurus certainly was not. True, the authors make no claims that Fig. 16.3 accurately portrays contemporary biologists’ opinion of Tyrannosaurus’ stance (although they allege that “these are … educated guesses”): but a student not already versed in paleontology could easily take the illustrations as such, and be needlessly ridiculed later on by evolutionist peers for his/her misconception. It could be argued that this inaccuracy is really a mistake on the part of the illustrator, and not Wile and Durnell; but the statement “[Tyrannosaurus reached] heights [italicization mine] of up to 40 feet”—only true if the animal stood upright—indicates support on their part for clipart.com’s restoration. But these oversights pale in comparison to the statement on page 499 that the order Rhynchocephalia “[includes] some dinosaurs”: I can find absolutely no reference to any dinosaurs being so classified at any point since the 1842 creation of the taxon Dinosauria (initially defined as comprising Megalosaurus, Hylaeosaurus, and Iguanodon) by Sir Richard Owen and the 1867 coinage of the Rhynchocephalia by Albert Günther (initially defined as the tuatara and its extinct kin). Granted, “Rhynchocephalia” was infamously used for many years as a wastebasket taxon, with a wide range of prehistoric reptiles being placed therein at one point or another (Fraser & Sues, 1994), but never, so far as I can determine, did these include species now regarded as dinosaurs: such a classification (if it ever existed) has certainly been completely out of vogue since the close of the nineteenth century at least. The assertion in question could be validated only if Wile and Durnell were using the term “dinosaur” very loosely—to refer to all members of any totally extinct reptile taxa—but Fig. 16.3 demonstrates that they are well aware that Plesiosaurus and Pteranodon, at least, are not dinosaurs, contrary to popular belief. I also discovered some errors in the textbook’s coverage of insects. A hasty generalization is made on p. 388 when Wile and Durnell assert, “flies are pests, but they can actually be quite dangerous.” Disregarding its imperfect grammar, this statement is imprecise: of the 120,000 known species of true fly—which are arguably the most ecologically varied single order of insects (Grimaldi & Engel, 2005)—only a few directly act to humans’ detriment, and of those, only the ones that are vectors of disease are anything more than a nuisance. And while this assertion regarding flies is merely erroneous due to a semantic slipup, the statement on p. 386 that “all species within [the] order Hymenoptera are … social insects” is downright false. To wit: 130,000 species of hymenopteran are described at present; but none of the 5,000 species belonging in the suborder Symphyta are eusocial, nor are any of the 70,000 species of parasitoid wasps belonging in the other suborder, Apocrita (Costa, 2006). All known ants (Formicidae) are eusocial—but only 12,500 species have been described (Fernández, 2003). The Vespidae (5,000 species) contains all known social wasps—but a good portion of its constituency is solitary (“Vespidae”—Wikipedia). Most social bees are included in the Apidae, but those species known so far to be eusocial number little more than 750 (Engel, 1999; Williams, 1998; Michener, 2000; Roubik & Hanson, 2004); a minority of species in the Halictidae (2,000 spp.) constitutes the remainder of the bee societies known to man (Michener, 2007): while all described species of bee together total nearly 20,000 (Danforth, Sipes, Fang, and Brady, 2006). With all of this data in mind, anyone with a command of arithmetic can determine that the majority of hymenopterans are solitary. No hymenopterist will tell you otherwise. With factual errors like this, it is no wonder that a noteworthy minority of scientists heap vituperation on creationism, while the majority regards it as below their scrutiny. Until creationists seek to surpass mainstream science in all respects—including high-school textbooks—any good scientist will be justifiably inclined (if not forced outright) to discount the veracity of Genesis. I urge you to correct the erroneous materials in Wile and Durnell’s book. I look forward to your reply at your earliest convenience. One could say that nitpicking is a petty pastime, and that I ought to argue a case, rather than harrumph at grammatical errors and Dr. Wile's belief that sticking large quantities of exclamation points to the ends of statements makes said statements true; and that may be so. Still, as I argued in my letter: strange as it may seem, laziness in fact-checking doesn't help the creationist cause. Thanks for your email and for taking the time to point issues with our text. Since no one text is free of errors, we here at Apologia strive to give our students the most up to date information and encourage our users to notify us of concerns they have with our texts. I will add your concerns to a list of topics to discuss with the authors. 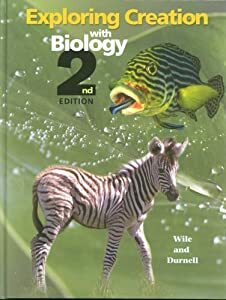 Given that Exploring Creation Through Biology was last updated 8 years ago, I doubt they will correct their errors anytime soon; since it is the only high school-level creationist biology textbook out there (so far as I can tell), Dr. Wile and Durnell have a captive audience. Bonnan, M. F. (2003). “The evolution of manus shape in sauropod dinosaurs: implications for functional morphology, forelimb orientation, and sauropod phylogeny.” Journal of Vertebrate Paleontology, 23(3): 595-613. Costa, J. T. (2006). The Other Insect Societies. Cambridge, MA: Belknap Press of Harvard University Press. Engel, M. S. (1999). “The taxonomy of recent and fossil honey bees (Hymenoptera: Apidae: Apis)”. Journal of Hymenoptera Research, 8: 165-196. Fernández, F. (2003). Introduction to the Ants of the Neotropical Region [in Spanish]. Bogotá, Colombia: Humboldt Institute Press. Fraser, N. & Sues, H. D. (eds.) (1994). “Phylogeny” in the Shadow of the Dinosaurs: Early Mesozoic Tetrapods. Cambridge, UK: Cambridge University Press. Grimaldi, D. A.; Engel, M. S. (2005). Evolution of the Insects. Cambridge, UK: Cambridge University Press. Hatcher, J. B. (1901). “Diplodocus (Marsh): its osteology, taxonomy, and probable habits, with a restoration of the skeleton.” Memoirs of the Carnegie Museum, vol. 1, pp. 1-63. Kermack, K. A. (1951). “A note on the habits of sauropods.” Annals and Magazine of Natural History, 12(4): 830-832. Leidy, J. (1865). “Memoir on the extinct reptiles of the Cretaceous formations of the United States”. Smithsonian Contributions to Knowledge, 14: 1-135. Michener, C. D. (2000, 2007). The Bees of the World. (1st & 2nd ed.) Baltimore: Johns Hopkins University Press. Newman, B. H. (1970). “Stance and gait in the flesh-eating Tyrannosaurus”. Biological Journal of the Linnaean Society, 2: 119-123. Riga, B. J. G.; Calvo, J. O. (2009). “A new wide-gauge sauropod track site from the Late Cretaceous of Mendoza, Neuquen Basin, Argentina”. Paleontology, 52(3): 631-640. Roubik, D. W.; Hanson, P. E. (2004). Orchid Bees of Tropical America: Biology and Field Guide. Santo Domingo, Costa Rica: INBio. Williams, B. H. (1998). “An annotated checklist of bumble bees with an analysis of patterns of description (Hymenoptera: Apidae, Bombini)”. Bulletin of the Natural History Museum (Entomology), 67: 79-152.